Glass Top Walnut Display Case for Colt Army or Navy Cap and Ball Revolvers. 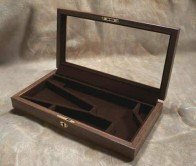 This is the perfect display case for your Colt Navy or Army cap and ball revolver set. Made from real American fine Walnut with a glass lid and velvet lining. It has the perfect size compartments for the revolver, Powder Flask and Bullet mould. And two other compartments that can be used for bullets or caps. The case is manufactured by Cimarron and has a the Cimarron logo etched in the glass. If you have any questions about this product by Cimarron, contact us by completing and submitting the form below. If you are looking for a specif part number, please include it with your message.